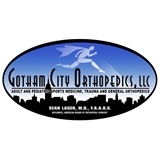 Gotham City Orthopedics (New York) - Book Appointment Online! At Gotham City Orthopedics, LLC every patient is treated like a MVP. Our team of physicians provides outstanding clinical care and a variety of surgical and non-surgical solutions. If you require Physical Therapy after Orthopedic surgery, NJ patients are guaranteed that one of our Board Certified/Board Eligible Orthopedic surgeons, Sports Medicine physicians and Physical Therapy staff will work collaboratively to create a treatment plan that works for each individual patient. Gotham City Orthopedics, LLC professional staff utilizes a leading-edge electronic medical record system to ensure that proper care and record keeping is achieved. When booking an appointment on ZocDoc please make sure to arrive 15 minutes before your scheduled appointment in order to fill out the necessary paperwork. Also don't forget your insurance card and picture ID. Dr Farber explained everything and answered my questions. He gave me several treatment options and let me decide but also gave his recommendation. His staff was also great!